For Mini-Monday's Painting I could have gone in all sorts of directions with the topic of REJECTION but I ended up with Brush Off a play on words. It is symbolic of being rejected from exhibitions - particularly 3 shows (hence the 3 paint brushes laying flat) that paintings of mine were rejected from last week. The paint brushes in the can are for shows that I do get into. Rejections and Acceptances are just intertwined in the process. 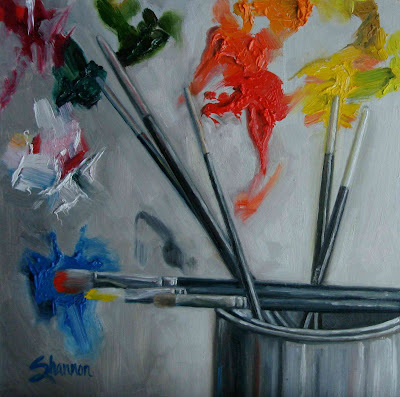 The background is a palette representing the amount of work involved in finishing a painting. The used, chaotic paints on the palette are kinda like the feelings one has when being rejected or brushed off. Inspired by the 3 Exhibitions that I didn't get into. Wlecome back. I hope you had a good week. I really like that painting, of course I love the symbolism!